How to make ice cream "Lakomka"
The taste of ice cream today since the childhood known to everyone. It is so habitual that we are not even trying to learn how to make ice cream. But it is quite a time-consuming process. And how in compliance with all its terms, depends on the taste of the future Goodies. The process of making ice cream at home and the production is very similar. Only the scale is different. First principal components (cream, milk, sugar, etc. ), the composition of which is different for each factory, are thoroughly mixed in a huge VAT. Then the mixture uvarivaetsja in a special cooking facilities and homogenized. In order to prevent the development of bacteria and its pasteurized, and then it adds the necessary flavor. It may be cinnamon, vanilla, fruit and any other variation. The resulting billet freeze. This is done through a huge pipe connected to smaller pipes. By and large, the tube is pumped the future of the ice cream, and the rest are cooling substances. Their roles are different chemical compounds (ammonia, etc.) that contribute to the rapid cooling, but never directly with the ice cream do not interact, therefore health hazards are not present. The whole process is controlled by the computer. The resulting cooled mixture is poured into special containers and is frozen for a short time (to avoid large crystals to very low temperatures. This process is called consolidation. After that, ice cream is ready for transportation. Make ice cream at home the recipes very much. But all they boil down to certain actions and products. The main components of ice cream include egg yolks and whipped cream. The delicacy owes its creamy texture. Other supplements depend on the taste of the manufacturer and used prescription. The components are mixed using a mixer, wooden spoon or whisk. Next, prepare the ice cream in the special ice cream shops. They are either manual or electric and are designed to ensure constant mixing. In the electric device provides the automatic cool mode. 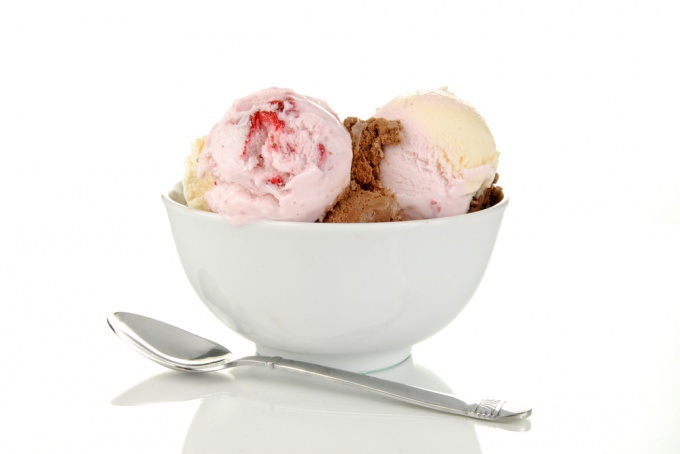 Manual ice cream maker consists of two containers, one of which is in the other. In the inner lays the ground for future sweets, and in foreign - shards of ice with salt. During cooking the mixture is continually stirred (automatically or using a special pen) until thickened (this hardening is not allowed). It is possible to implement the entire process manually, but it requires some effort and constant stirring, which is not always convenient.